Shuntaro Furukawa has given his first interview since the news broke that he would be replacing Tatsumi Kimishima as Nintendo's president. We will develop the company to its fullest. I will balance Nintendo’s traditions: originality and flexibility. Industry analysts have been giving their opinion of the new president, who will be formally appointed in June. The key thing here is that management is getting younger. They will have to execute the Switch’s growth plan, so in that sense this is a new start. Furukawa comes across as thoughtful, very knowledgeable and quite well informed. He is fluent in English. He may be the perfect person to fill the communication gap that exists between Nintendo and investors. Let us know what you think of Furukawa's appointment - and his comments - by posting something below. A CEO needs to be a businessman, of course; but it warms my blackened withered heart to see that he’s a gamer as well. Brings back memories of that Iwata speech. You know the one. He sounds like the perfect fit. Nostalgia from growing up with the brand mixed with innovation for the future. Good job Ninty! I hope Nintendo will getting better with Shuntaro Furukawa as Nintendo president. Well, they listened to people's demands: Replace old people with young ones. Let's see what they'll bring us in the future. Whatever you do Nintendo.. KEEP THE T H I C C! Jokes aside, though, nice to know Furukawa isn't messing around, apparently. I hope my grim predictions prove to be cartoonishly false. Given how well Kimishima was doing, I wouldn't have listened to the demands. We'll see. I really liked what Kimishima did with Nintendo from business perspective. Curious to see what Furukawa opinion is going to be on Nintendo's future. Wish them both the best. Excited to see what direction he takes the company in, and best wishes to whatever Kimishima has in store next! I hope he is a F-Zero and Pilotwings fan. I hope that this president has the strengths that both Iwata and Kimishima had while negating their weaknesses. What I mean is that with Iwata; his major strength is that he was clearly passionate about gaming and you could tell that he absolutely loved his company and his work while his major weakness was that he wasn't exactly the greatest with handling the business and marketing aspect of the company, judging by how badly Nintendo was doing during 2012-2016. As for Kimishima, he was the complete opposite, he was much more business savvy than Iwata was and all the articles stating how much of profit Nintendo has made this fiscal year (as well as the excellent sales of Odyssey and BOTW) clearly shows how much better he was running the company, but his major weakness to me was that he came across a 'business guy first, gamer second', I never really got the feeling that gaming wasn't all that important him. He just seemed very cold and corporate to me. I just hope that this new president has an obvious passion for gaming as well as being an excellent president who can continue maintaining the success that Nintendo has been achieving this past year. In all seriousness, Shuntaro Furukawa has spent a lot of years at Nintendo (Since 1994, I believe) and seems to have a lot of genuine passion for the company and its history. Now is his time to shine, so best of luck to him! @Tarolusa From what I understand Furukawa worked on the Switch's marketing and we can see how well that's worked out. I've got a good feeling about him. ...but be honest, do they really have any power over Shigsy and his chums and what they're making? If Miyamoto says the next Zelda game is delayed a year, does Furakawa really have the ability to say he wants it released now no matter what state it's in? To me it's more a job that is lead by product instead of him leading the product. Every photo of Kimi looks like he's just had a whiff of a bad smell. "What I mean is that with Iwata; his major strength is that he was clearly passionate about gaming and you could tell that he absolutely loved his company and his work while his other strength was that he was amazing with handling the business and marketing aspect of the company, judging by how well Nintendo was doing during 2005-2011." Yes, the Wii U was a failure. But the Wii and DS were their biggest success stories ever and they were also a part of Iwata's legacy. It just really bothers me that more and more people seem to paint Iwata as "bad at business". If he had passed away during the Wii/DS era, we'd still be hearing about how ridiculously successful the company was thanks to him and that, because of his death, the Wii U was a failure. Also, don't forget that Iwata was key in getting the Switch off the ground. So yeah, if the man was responsible for the Wii, DS, 3DS and Switch, I don't think anyone should use the Wii U as an example of Iwata being "bad at business". I like the fact that the management is getting younger. Japan's highest CEOs are usually very old people and Japanese society as a whole is very stagnated, to the point that many companies still use fax machines for internal communication. Not something you'd like in business of state-of-the-art electronic entertainment. So he is fluent in English? Lets see him in a direct! Him being fluent in English is an exciting thing, because it knocks down a small barrier for English audiences by giving us a face for a Direct that can communicate fluently in both directs. On top of that it sounds like he is a melding of old school sensibility with an eye toward the future, a game and businessman. Considering he has had a hand in the thus far stellar marketing of Switch, I'm excited to see where he take the company. so more poor decision making at the detriment to the customer. good game N. good game. While I'm sad to see the current CEO of Nintendo retiring, I'm sure his replacement will do a good job. Plus, from what I hear on this comment section, the new CEO of Nintendo is a gamer like us. Farewell Kimishima. It was short but you did well. You took charge at a difficult time and right the ship while setting up the long term future. Thank you. Hope he brought Nintendo success like Yamauchi and Iwata did. Kimishima was good too but he didn't bring anything new to the table instead just sticking to what ideas Iwata left behind so I don't really count Kimishima as a true president but as a vice president for Iwata in the case of Iwata's passing. Anyways we the fans welcome and look forward to whatever success you will bring to Nintendo Shuntaro Furukawa. Sorry guys I missed the news, why is Kimishima being replaced already? Hey cool, good for him! Also hey, if you grew up playing Famicom, let's talk virtual console on the Switch! But more than just Famicom, let's get Famicom and Game Boy all the way to Gamecube and GBA! Come on man, I am ready to throw money at you. Hell, I will literally go to Kyoto if need be and physically throw the money at you if that is what it takes! He's saying some of the right things....but....whenever they start with hyperbolic "new heights" always make me wonder if it's required lip service, or an introduction to becoming more "profit oriented." My guess is windfall profits and a stable Switch ecosystem were as good a time as any to pass the baton while things are in a good place. I'll miss all the memes and gifs that appeared with Kimishima. A bit more serious, though, they always said Kimishima would be a stop gap between Iwata and whoever came next, and he was what the company needed in terms of changing focus and reverting the losses from the Wii U. That the new President was involved in the marketing part is auspicious, I wish him the best. @Saego I believe Kimishima-san is very underrated. He had experience in North America and had a sense of what would sell well outside of Japan. I think he was the right person at the right time. I'm a little nervous making abrupt changes now, when everything is going so well, but I like the direction of having a gamer in charge (again). @NEStalgia ""new heights" always make me wonder if it's required lip service, or an introduction to becoming more "profit oriented."" Neither, I believe he's simply talking about leveraging all of Nintendo's strengths, while correcting their weaknesses, in order to make them more agile, more ambitious, more prolific, and more refined than they've ever been. Come on! Maybe we will get third time lucky.......fix the furuking voice chat and online party system! I noted the use of a Panasonic laptop. Remember the Q? I wonder if they have other business ideas together? Kimishima did a good job, but he always was intended to be a short term president if I recall correctly. 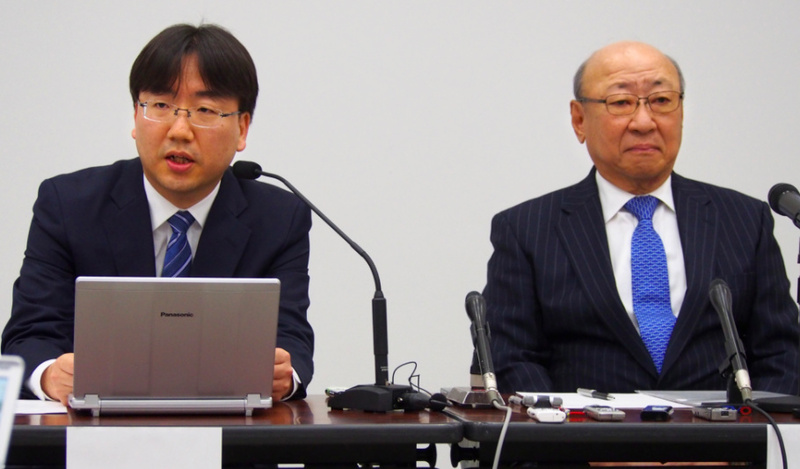 Best of luck to Furukawa, Kimishima is giving him a great foundation to work from. Fluent in English? Please understand....ok? Wait, so how long have we known about this guy replacing Kimishima? This is the first I've heard of it. I still personally think Koizumi would make an amazing president; he reminds me so much of Iwata with his charm and creative spirit. Perhaps he's best suited on the game development side of things, though. I want Furukawa to stand down. He’s done nothing so far. @TheMistermanGuy That's encouraging, at least to an extent! Still no Iwata.....a gamer and businessman still isn't as great as a gamer, game developer, game designer, and businessman. But it'll do. @WiltonRoots There hasn't been a single direct since Furukawa took over. And we still don't have Netflix! I blame Miyamoto. The moral of the story is that the fleas understand. I hope he's an F-Zero fan. His face reminds me of a hamster (not in a bad way), haha. Furukawa seems quite promising, and I highly doubt his appointment was made lightly. He gives off the impression of a great businessman, and the Famicom background is a definite plus. @Luna_110: I'm sure there will be memes for him soon enough. He grew up playing the Famicom. Not quite sure exactly what this statement means but maybe he will get VC on the Switch that many of us have been waiting for? What's the point of making a video when there's no actual footage to show? This would've made a lot more sense as a podcast, for example. I usually love your videos but this one was just confusing and makes absolutely no sense in the context of this article. When I saw the thumbnail, I expected to see and hear Furukawa talk, ideally in English. @Balladeer I think that any respectable Nintendo fan knows. Well he can't be as terrible in English as Shigeru Miyamoto. I don't understand why some Japanese and Chinese executives find it so hard to learn to speak proper English. Its an easy language to approach. "Now as a member of management with Super Mario’s creator Shigeru Miyamoto, I have a lot of respect for him. On the other hand, with this new job that can’t just be it, so I expect to say what needs to be said to run the company." tatsumi will still be around giving the new president advice time to time. Nooo, Shatoru Shibate left the post of president of Nintendo of Europe??!!!!! That's also huge news, he was pretty much my favorite guy from Nintendo that has been in public. Wonder what mister Shibata-san will be doing then.